HomeBooks by AgeAges 0-3What To Read Next? Synopsis: As everyone knows, nothing is sweeter than tiny baby fingers and chubby baby toes. . . . And here, from two of the most gifted picture-book creators of our time, is a celebration of baby fingers, baby toes, and the joy they—and the babies they belong to—bring to everyone, everywhere, all over the world! This is a gorgeously simple picture book for very young children, and once you finish the rhythmic, rhyming text, all you’ll want to do is go back to the beginning . . . and read it again! The luminous watercolor illustrations of these roly-poly little ones from a variety of backgrounds are adorable, quirky, and true to life, right down to the wrinkles, dimples, and pudges in their completely squishable arms, legs, and tummies. Synopsis: That Ruby! Wherever she goes, table cloths accidentally pull dishes to the floor, flowers get trampled and spaghetti somehow end up in her hair. You can’t take Ruby anywhere! One sunny morning, the postman brings Ruby an amazing invitation to have tea with — the Queen! Ruby had better polish her manners and quickly. Will Ruby really be ready in time? Sarah Ferguson, the Duchess of York, and Robin Preiss Glasser know a thing or two about the importance of manners and poise and being ladylike. 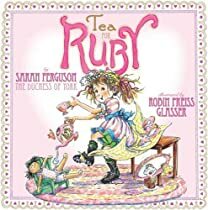 In Tea For Ruby they have created the irrepressible Ruby, whose antics and foibles will touch readers’ hearts as she tries her very best to do things correctly. In the end, she knows she is loved for who she is, and that she will always be a princess, royal or not! Synopsis: What do you do when your new best buddy has been designated a scourge by the community and marked for imminent extermination? Just ask Kenny Rabbit. When the simple folks in the sleepy little village of Roundbrook catch wind that there’s a dragon running loose in the countryside, they get the wrong idea and the stage is set for a fight to the death. So it’s up to Kenny to give his neighbors front-row seats to one of the best-known battles in history — the legendary showdown between St. George and the dragon — without losing a friend in the fray.